Ok, so the other day I made this bubble skirt for my cousin, Mady. I am a direction follower, and there were lots of directions, so I thought it would be a really easy project for me. Foreshadowwwwwwing….If you got even a D- in your English class in high school, you can probably guess that it was not easy. No. Not at all. I was Googling, YouTubing, asking Mike, FaceTiming with my mom. We finally figured out that the directions were a) worded poorly and b) wrong. Eventually, the skirt turned out really well. So, I thought I would walk you through the process I came up with so that you can save some time…like 10 hours to be exact. Ok? Ok! 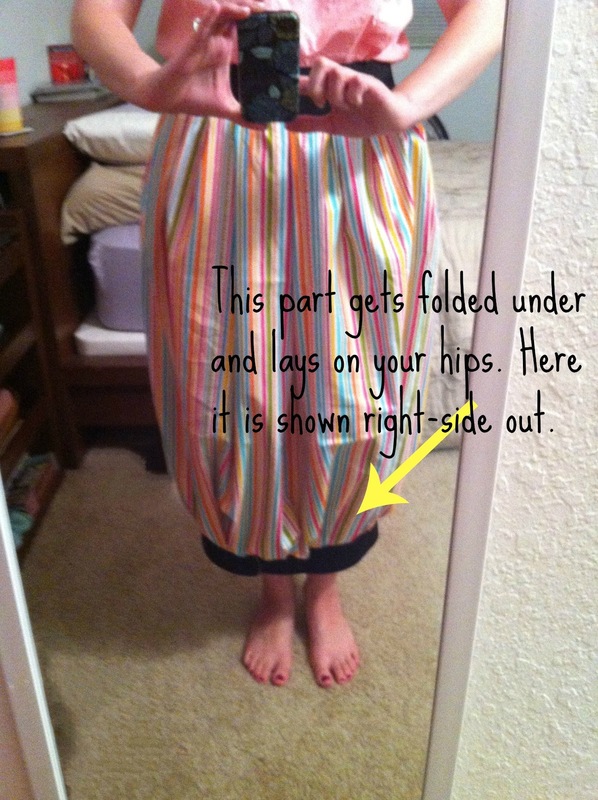 Use 1/2″ seam allowance when sewing. 1. Measure around your natural waist and add 1″. Cut a piece of elastic to that length. 2. Measure above the fullest part of your hips and add 1″. Cut another piece of elastic to that length. 3. Cut the 2 yard piece into two 1 yard rectangular pieces. 4. For an adult mid-thigh length skirt, cut each 1 yard piece into a 29″x45″ piece. For a child, cut them into 21″x45″ pieces. 5. Place fabric rectangles right-sides together, pin and sew up the short sides using a zig-zag stitch. You now have a big fabric tube. 6. Place short ends together for the waist elastic. Pin and zig-zag stitch. Repeat for the hip elastic piece. Now you should have 2 elastic circles. 7. Quarter mark both elastic pieces with chalk. 8. Quarter mark both raw edges of your fabric tube. 9. With right sides together, match an elastic piece to each raw edge (these will be the skirt waistline) of the fabric tube using the quarter marks as a guide. As you attach the elastic to each raw edge, gather it evenly so that your skirt will have a…well…gathered effect. 10. Attach the elastic to each side using a zig-zag stitch. Now you will have a fabric tube with a piece of elastic on each end. 11. Your skirt is still inside out here. So, step into it, and pull the hip elastic (the larger piece probably) over your hips. 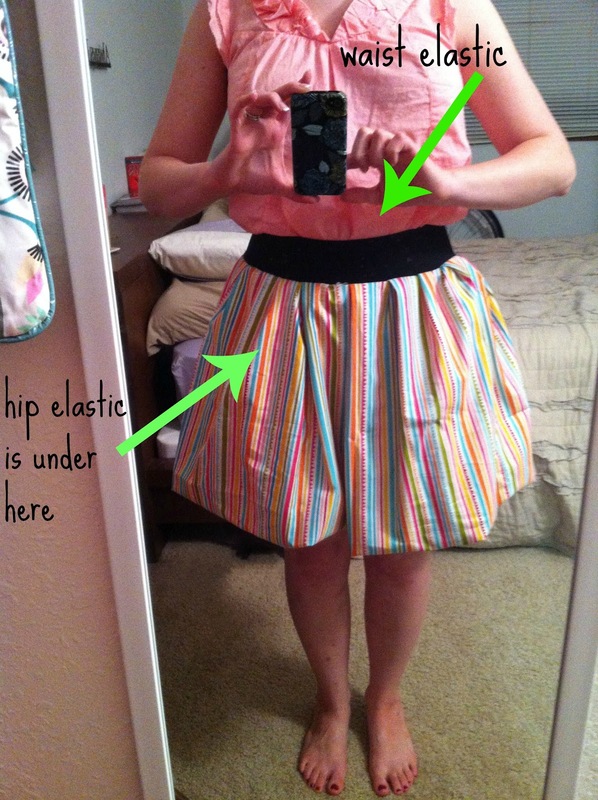 Fold the skirt up and place the wait elastic over your waist. 12. Your skirt will be right side out now. And it will be done. And really cute. And you won’t be stressed out…like I was not either. Too bad the skirt wasn’t for meeeee.